Purple Sheets Review - Are Bamboo Sheets Soft and Stretchy Enough? 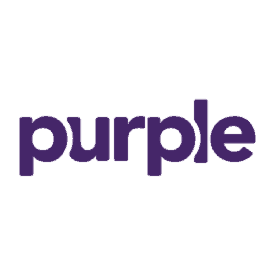 Since its founding in 2016, Purple has swiftly risen to be one of the biggest names in the world of online bedding. The bedding brand has also carved out a rather unique reputation with its patented hyper-elastic polymer, ten-pound pillows, and cheeky advertising (have you seen the raw egg test?). And many of you may already be familiar with our reviews of Purple’s many mattresses — but this time, we’re diving into Purple’s bedsheets. 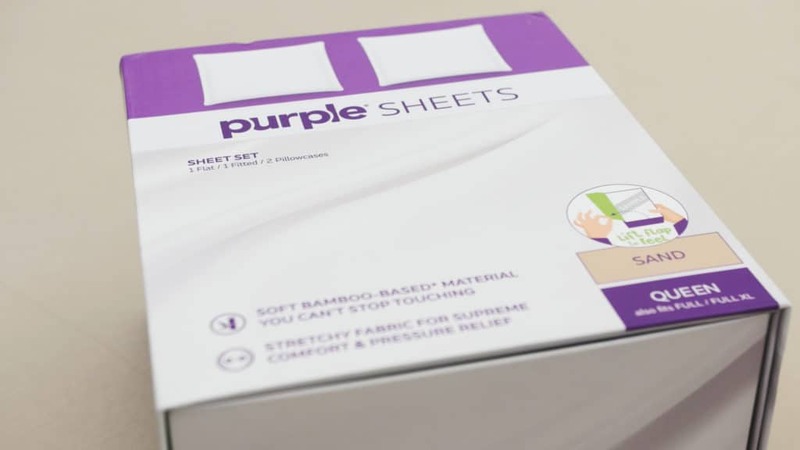 In this review, I’ll be getting up close and personal with Purple so we can get a good look at what this sheet set is all about. I’m going to show you what I love about Purple sheets, what I’m not so crazy about, and what sets this bedding apart from every sheet set I’ve ever tested… like, ever. No time to read the full review? Click here to skip to the summary! Each Purple sheet set comes complete with one fitted sheet, one top sheet, and two pillowcases. 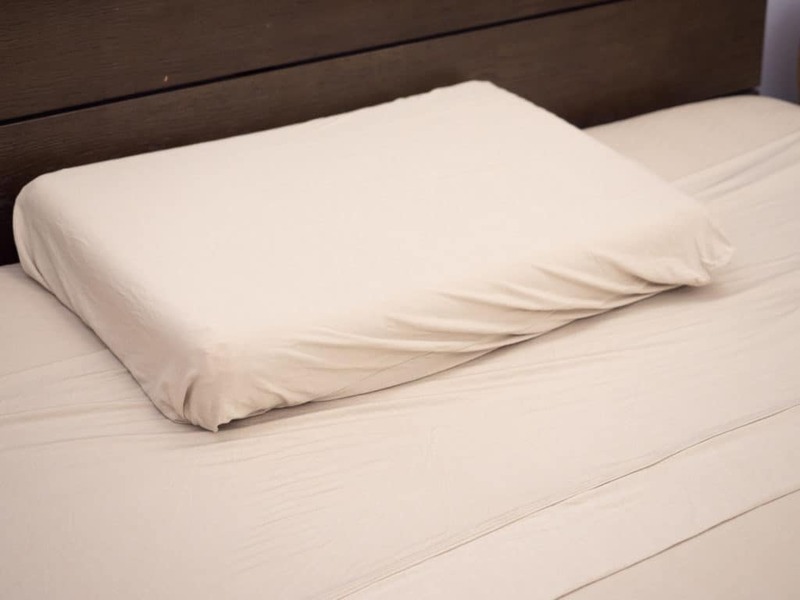 The fitted sheet is capable of accomodating mattresses up to 16 inches deep (which are relatively deep pockets), and the pillow cases open on the sides. The sheets themselves come in a cute little box with a cutout that allows you to see what the sheets look like and how they feel (before actually unboxing them). Additionally, the sheet set comes tucked away in a garment bag made from the same stretchy material as the sheets themselves. Sleepers could reuse this bag for bedding storage, or to store other knick-knacks. Purple’s sheets are made from a blend of spandex and viscose from bamboo which is intended to offer a soft, breathable, and stretchy feel. The folks at Purple do not include specific weave or thread count information with these sheets, and maintain that thread count is “ancient history.” And while thread count is not exactly negligible, Purple is not the only brand endeavoring to teach sleepers that there is much more to consider when hunting for your perfect bedding. However, the Purple people do assert that bamboo-based bedding makes for the best bedsheets. Of course, that’s a subjective opinion that’s up for debate, but fabric derived from bamboo does have a reputation for being naturally breathable, moisture-wicking, hypoallergenic, durable and eco-friendly. I know — that’s a lot of perks right? Well, there are some great advantages of bamboo-based sheets, but it’s worth noting that there is still some question about how much those qualities are transferred into the sheets once the bamboo fibers have been spun into fabric. Simply put: just because the bamboo plant offers all of these wonderful things does not necessarily mean that fabric derived from bamboo will take on those characteristics. That being said, I did find these sheets to offer certain special qualities that I’ve found to be specific to bamboo-based bedding, so keep reading to find out what they are! These sheets are smooth, cool to the touch, and very stretchy. The blending of viscose from bamboo and spandex foster a knit-like feel that is, to me, very comforting. The Purple sheet set does seem to take on some of the beneficial characteristics of bamboo as well. The sheets are very breathable and light, but they also feel quite durable. It kind of feels like you could stretch them for miles and they’d bounce right back to their original form without a single tear. While that is, obviously, an exaggeration, I did find this hyper-elasticity to flex with the Purple mattress in a way that seems unique to Purple. The Purple sheets and the Purple mattress feel like they were made for eachother in that the sheets adhere so closely the shape of the mattress. Furthermore, the hyper-elastic polymer in the mattress is quite stretchy too, so both the bed and the bedding flex with each other in a complementary way. There was no gapping or bunching of materials in my experience testing these sheets, and the fitted sheet stayed snugly put despite all of my rolling around. I also noticed that these sheets adopted some of bamboo’s moisture-wicking properties which will be particularly beneficial to sleepers who run hot. They feel very soft and cozy, but you can also feel the air flowing through the fabric as you fan the sheets out over the mattress. Overall, I wouldn’t call these sheets crisp nor would I call them silky. They are very soft, smooth, and stretchy in their own uniquely Purple way. I have to be totally honest here: I am not very compatible with Purple’s pillow or mattresses, so I really wasn’t sure how I was going to feel about these sheets. But after thoroughly rolling around in this bedding, I have to say that I was pleasantly surprised. After I unboxed the Purple sheets and spread them out over the mattress, I noticed two things right away. Firstly, these are by far the stretchiest sheets I have ever felt. The elasticity of the spandex combined with the light breathability of the bamboo offers a very soft and stretchy feel. Even as I pulled the fitted sheet over the mattress, I could see how quickly it bounced right back onto the bed. With the fitted sheet in particular, this made for a very snug fit (which I love). 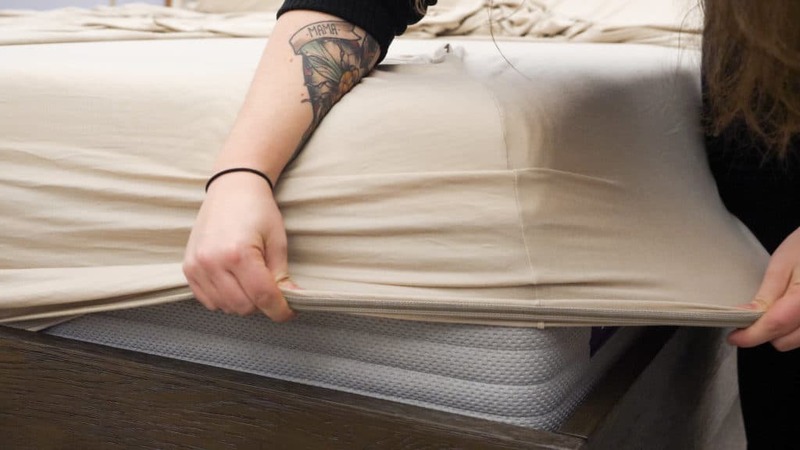 I found this extra elasticity to really help the fitted sheet adhere closely to the mattress which served to prevent any gapping or bunching of material. It just made for a very clean looking bed. The second thing I noticed was that, contrary to everything I’ve experienced with bamboo-based bedding thus far, these sheets were completely wrinkle-free. Honestly, I had to check the tags just to make sure that these sheets are, in fact, made from viscose from bamboo because every set of bamboo sheets I’ve ever tested have been riddled with wrinkles! So, by the time I finished making the bed, I was feeling quite impressed by how seamlessly these sheets fit the Purple 3 mattress. However, I can’t say the same thing for the Purple pillow. As I dressed the Purple pillow with the pillowcase, I was kind of shocked at how poorly it fit. The pillowcase is, in my opinion, way too big for the Purple pillow; and that same stretchy quality further served to make the whole fit look baggy and loose. The Purple pillow isn’t a very lofty pillow, but even on a Queen size pillow, the fabric hung loosely. Of course, the baggy fit of the pillowcase didn’t detract from the smooth comfort of the material. Rolling around in these sheets, I could feel how soft and comforting they are, but also how incredibly cooling they are! As I billowed the top sheet over my body, I could feel the air flowing through the fabric in a way that was more than just breathable — it felt like someone was blowing cool air on me. For me, this is a big perk as I am a year-round hot sleeper. That being said, folks looking for warm-and-cozy might want to search elsewhere. 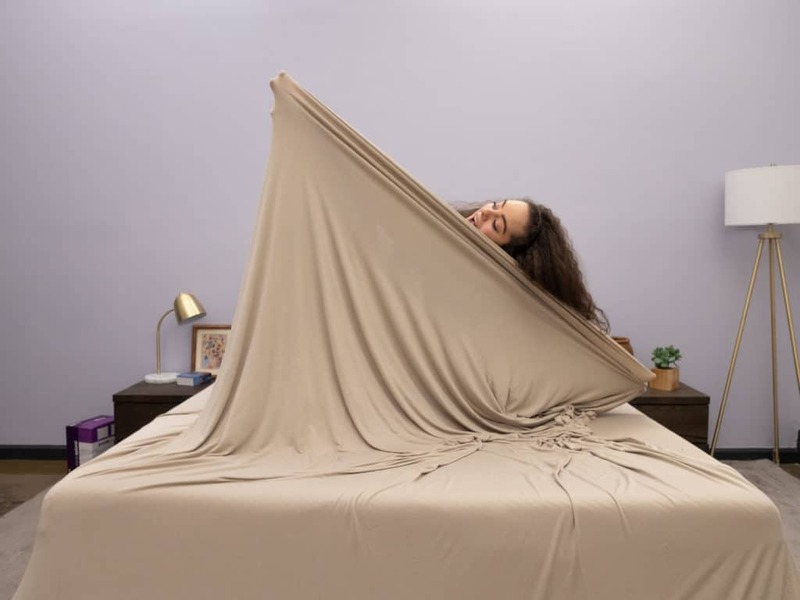 I’m not convinced that these sheets would keep you warm in the winter, especially if you’re a naturally cold sleeper. If you do tend to get chilly at night, I’d save these sheets for the summertime when we’re all trying to stay cool. 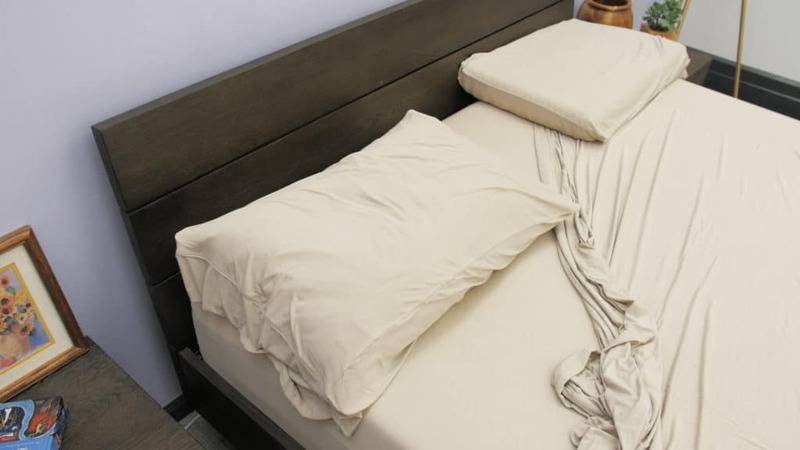 I think these sheets would make a great addition to a sleeper’s collection of bedding essentials, as I do think that a set of bamboo-based sheets is great to have in your roster of sheets. And they do bring something unique to the sheet game with their stretchy nature (and the fact that they seem very resistant to wrinkling). The Verdict: I think that sleepers who need help keeping cool at night (and also want to try something a little different from the classic cotton sheets they’re used to) would be most compatible with Purple sheets. ARE PURPLE SHEETS WORTH IT? 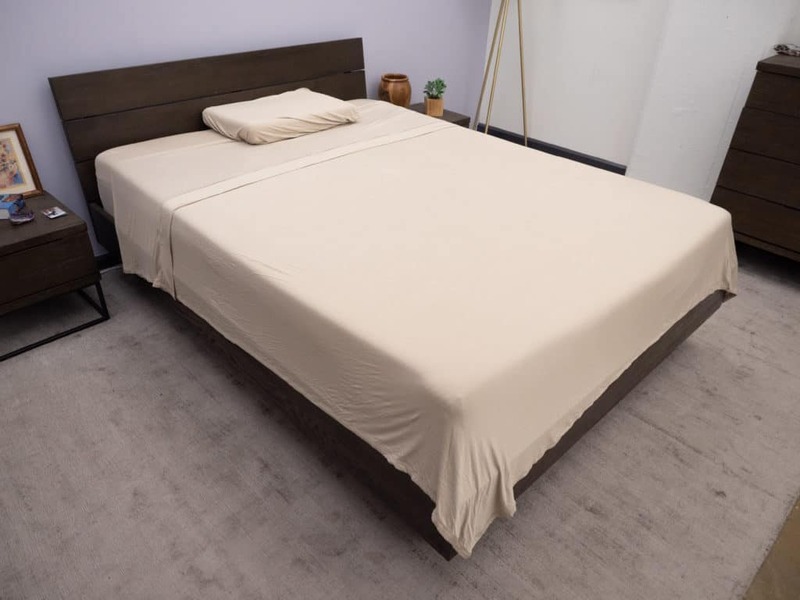 Hot Sleepers — Bamboo based bedding has a tendency to be naturally breathable and moisture-wicking, and these sheets are no exception. I felt some nice cooling comfort while rolling around in this bedding, and I know these sheets are going to help keep me cool throughout the night (even in the summer months). 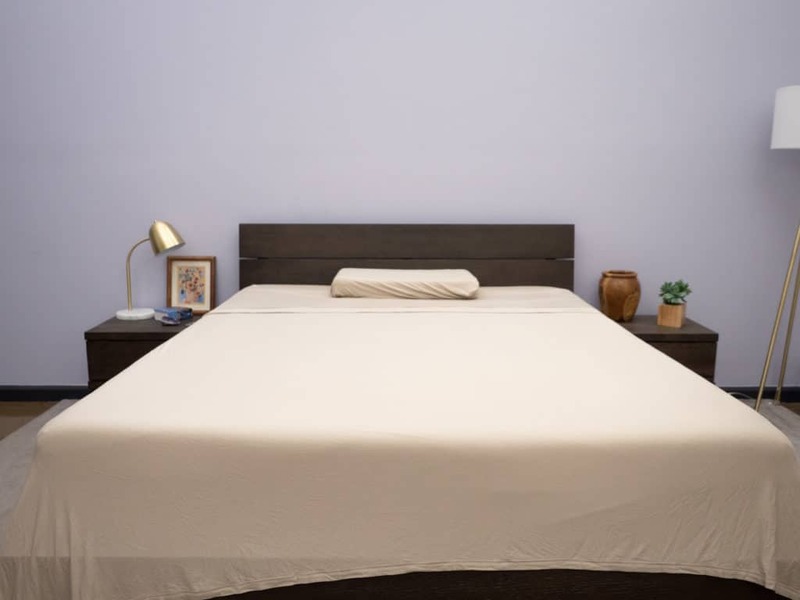 Sleeps on a Purple Mattress — The stretchiness of these sheets allows the fabric to flex with the the hyper-elastic polymer in the Purple mattress to offer this all-embracing sink into the materials. Essentially, the combination of the sheets and mattress makes you feel sort of immersed in Purple. I’m not sure if you’ll get the same sort of feeling on a different mattress that’s not from Purple, but I did find the Purple sheets and the Purple mattress to complement each other really well. Prioritizes Easy Care — Something that I tend to look for in bedding is easy wash care, so I’m glad to know that these sheets are machine washable and dryable. Just machine wash on a cold cycle, tumble dry on low heat, and you’re good to go. HOW DO PURPLE SHEETS COMPARE? There’s a wide world of bedding out there, and sometimes deciding which is the right bedding for you can feel like a chore. So, let’s take a look at these Purple sheets alongside some of the other popular sheets I’ve reviewed. This way, you can get a sense for what type of sheets you’re most compatible with (without having to test them all first!). Purple VS Brooklinen — We’re talking about apples and oranges here. Purple sheets offer that smooth stretchiness while Brooklinen’s cotton percale is super crisp. Crispness is one thing that I did not find with Purple sheets at all, so if you’re more into that freshly ironed dress-shirt feel, go with Brooklinen.I did find both to be breathable, though, so I would say both are better suited to warmer climate. So, hot sleepers might enjoy the cooling qualities of both these sheet sets. Purple VS Parachute — Again, Purple’s sheets are going to feel much more soft and stretchy, while Parachutes percale sheets feel very crisp to the touch. Parachute’s sateen woven sheets are going to offer a silkier, smoother feel, but still very dissimilar to Purple. Parachute’s percale has a bit more in common with Purple’s sheets as they are both light and breathable (while Parachute’s sateen is thicker and less airy), but again, Purple sheets are kind of in a league of their own. Purple VS Lime & Leaf — If I had to pick the sheet set (of these three brands) that is most similar to Purple sheets, I’d pick Lime & Leaf. They aren’t stretchy, but they are garment-washed so there’s a bit of extra softness going on. They are also both super light and airy, making them great picks for summertime. Between the two, though, Lime & Leaf is still bringing a crispness that is not present in Purple sheets. And, as with every sheet set I’ve ever tested, Purple’s are way stretchier. Not Warm — These sheets are super airy and light, and kept me quite cool. If you’re looking for something a little more warm and cozy, you might not be quite as compatible with these sheets. No Trial Period or Returns — Often times, bedding brands will offer trial periods wherein you can test their sheets for a month or so to get the sense of what they’re all about. But not only is there no trial period with Purple sheets, there are no returns either. So, basically, you better be sure these are the sheets for you before you buy them. 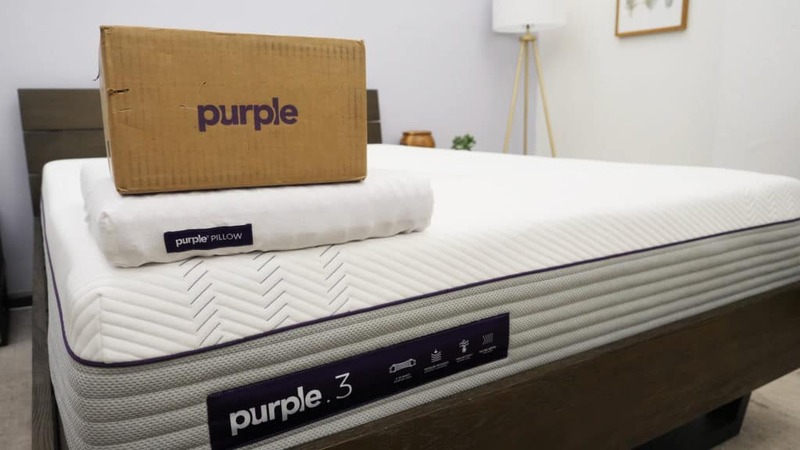 Made by Purple, for Purple — After testing these sheets, I really feel like they were made specifically for the Purple mattress (and I wonder if they might lose some of their specialness if you were to use them on a different mattress). 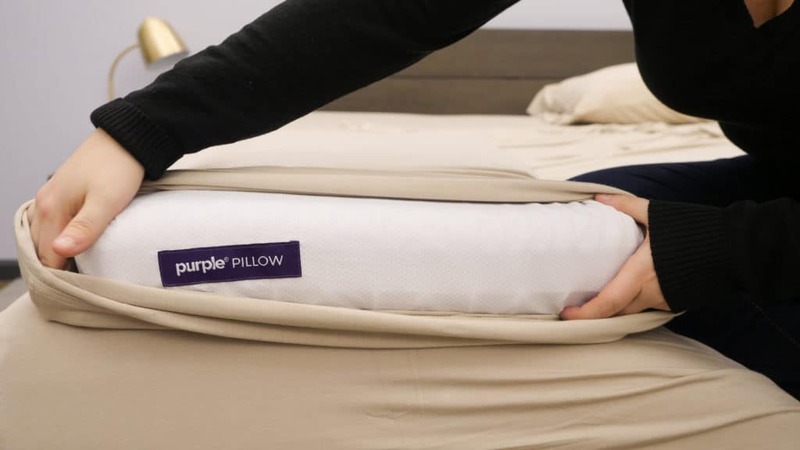 The folks at Purple do say that the sheets are designed to be most compatible the Purple mattress, so if you don’t sleep on a Purple mattress, that’s something to consider. The Purple sheets are quite impressive. Their thinner, more elastic design helps improve breathability, comfort, and durability, all while offering top notch quality. Made from a combination of bamboo and spandex, these sheets perform almost as if they are a performance sportswear. If you’re looking for cooler sheets and like the idea of an extremely elastic sheet set, the Purple sheets should definitely be considered.